They are the best of times, they are the worst of times, they are places of wisdom, they are places of foolishness, they are places of belief, they are places of incredulity, they have seasons of Light, they have seasons of Darkness, they are the spring of hope, they are the winter of despair, they lay everything before us, they lay nothing before us, we are all going direct to Heaven, we are all going direct the other way- in short, these places are so far like right here, right now, that some of their noisiest authorities insist on them being received, for good or for evil, in the superlative degree of comparison only. The wind howls and again I dive for the bending pole, pushing it back into its correct formation and quickly assume the bracing position. My arms are spread with one hand on the middle pole and the other on the end pole while my head hangs down and presses back on the yellow fabric of the tent wall. The wind retaliates and pushes me backwards demonstrating its strength against my squatting position. I drop to my knees and drive forward determined not to loose this battle. The wind mellows momentarily after its sudden and violent shift in direction. I glance over at Jorn who is fighting his own battle at the other end of the tent. “Is it broken or just bent?” he asks over the once again increasing howl of the now northwesterly winds and sheets of rain falling on the fly. The matagouri thorns drove into my legs, grabbed at my clothing and skin and I couldn’t help looking for the berries of the calafate bush. “Not sure” I respond trying to peek out the door for an assessment, which is no easy task in the rising fury. The wind bites back and I abandon my attempt in order to resume bracing, but not before exchanging glances of bemusement with Jorn. “Just remember Justine, it’s all about fighting The Good Fight” I had said not five minutes before as our last student check-in wrapped up and she was crawling out of the tent. “Persevere, tighten guy lines, move rocks, brace your tent, you know, all that kind of stuff” I responded to her quizzical look. “Will do” she says with a smile as she exits the vestibule into the cold, wet, and windy day. 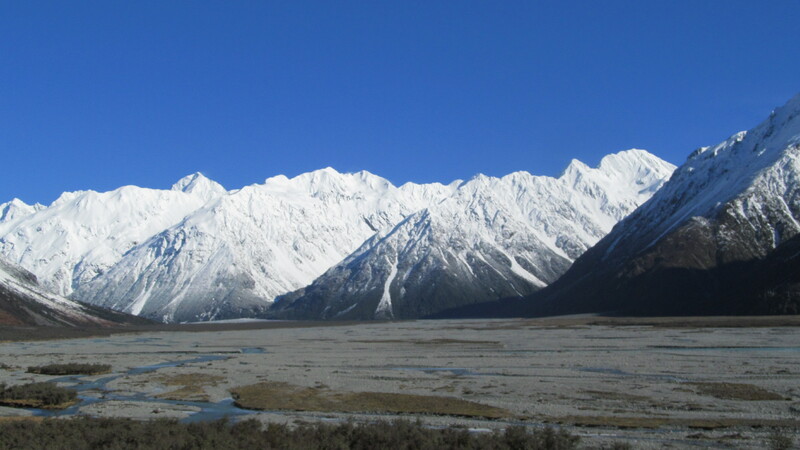 When I got off the bus for the first time in the Rangitata River valley more than three years ago I marveled at how much the landscape resembled that of its Roaring Forties cousin across the Pacific, Patagonia. There are wide, flat bottomed valleys with riverbeds that are kilometers wide. These river beds meandering through wide glacial valleys, sparse vegetation, low shrubs, gravel roads, and constant wind all hinted at the landscape of South America’s southern most region. The matagouri thorns drove into my legs, grabbed at my clothing and skin and I couldn’t help looking for the berries of the calafate bush. I wandered westward up the Raikia River as the persistent drizzle fell from the grey sky and the steep peaks jutted out of the valley into the low hung clouds and for the 100th time the comparison crossed my mind. Earlier we paused briefly at a small hut beyond which lay a southern beech forest dark and green with moisture dripping from its rounded leaves. We pushed onward, down a livestock track and herded a flock of sheep across a hillside as we moved westward. The small hut we made our camp near that night, Thompson Hut, could have easily been a refugio in the Chilean bush, housing weary gauchos. Despite all these physical similarities and so many more, including New Zealand’s location in the Roaring Forties (the area located in the region of 40 degrees south latitude that is infamous for its heinous weather due to so much water and so little land mass), it wasn’t until I uttered those words to Justine as she exited my tent that I truly grasped why this fully developed, prosperous country was so much like the remote, barren land thousands of miles to the east. It goes beyond the idea of Gondwanaland, supercontinents, plate tectonics and the Nothofagus. It is not just the weather, the landscape, the agricultural nature, the sheep or the topography either. It is the attitude, the perseverance and the tenacity that is needed to successfully climb in these hills. Both New Zealand and Patagonia require fighting The Good Fight, for nothing worth having comes without some sort of fight. In these places the good fight is more than just an upward or downward battle. It is a battle against lethargy and homeostasis. The wetness in New Zealand is as pervasive as it is throughout the high camps of the Chalten massifs and various other alpine regions of Patagonia. Days of sitting in a tent at Niponimo , in Valle Piritas, or Cordon Contreras are not all that different from days in a tent at McCoy Creek, below the Chancellor Shelf or on the Lambert Tops. Sure I run into less folks in the backcountry of the Southern Alps than at Chalten’s often crowded high camps. In both places though, we all do the same thing; we sit and wait. New Zealand’s Southern Alps required The Good Fight from me a lot in the six months I have spent down there. More than one hundred twenty days in the mountains of New Zealand and I have maybe six summits to show for it. That can be a good percentage in Patagonia and for me, it is now the norm for New Zealand. Persistent inclement weather meant days of sitting in tents, wet, whiteout travel and just waiting out storms. The weather of New Zealand is one of the best teachers of tolerance for adversity and uncertainty that I have ever experienced. It keeps me in shape for Patagonia and vice versa, though I do not get stronger working or climbing in Patagonia or New Zealand, at least not in the physical sense. The constantly variable weather has required high degrees of flexibility and patience. In these places The Good Fight is more than just an upward or downward battle. It is a battle against lethargy and homeostasis. It is the battle against letting alpine dread creep in. It is fought within one’s heart and mind against an apathy that will ultimately only lead to failure. It is fought by not letting small things go. It is fought by not wasting the good days, even if it is only one. It is fought by getting up and checking the weather every morning at three. It is fought by constantly being at the ready. And that is what we have had to do and will continue to do. And now The Cruel Mistress is calling me back again. Once again I am heeding the professional call of New Zealand’s Southern Alps and will travel with a gaggle of NOLS students back to the place that gave me the wettest and windiest conditions that I have ever experienced. I have no doubt that this year’s processes and outcomes will be the same, yet in this weird, addictive, masochistic way, I can’t help but go. At least her twin sister Patagonia has kept me in practice.